I’ll have something other than Destiny to talk about soon (I hope), but until then I’m going to keep enthusiastically posting about Destiny. The first week of The Taken King has been awesome so far, and at times I’ve found I’ve been unable to put the controller down. 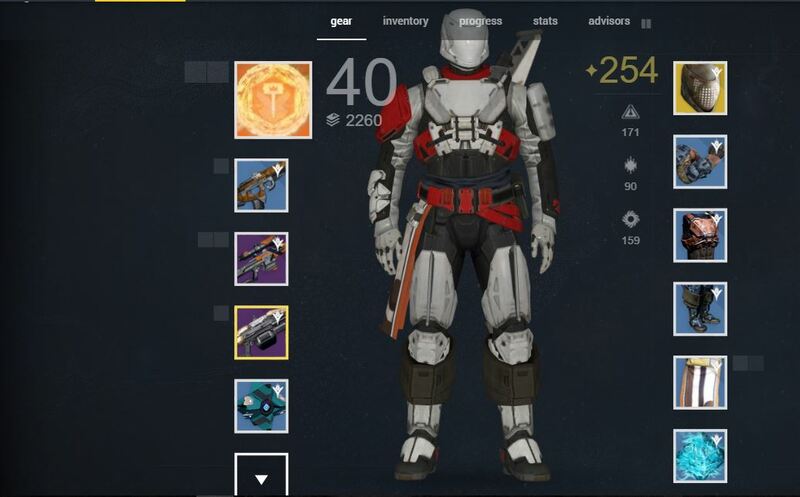 Destiny seems to have finally gotten the loot driven gameplay loop right. I’ve never seen so many items and engrams drop at almost a constant rate during missions and strikes and I’ve found myself wanting more and more as I’m almost always finding something useful that edges my light level higher. I worked my way through the story missions throughout the week, and with a little help from the Crucible I managed to hit level 40 by Friday. It was a slow rise, as many players hit 40 the day The Taken King released, but I wasn’t dedicating an insane amount of time to the game. 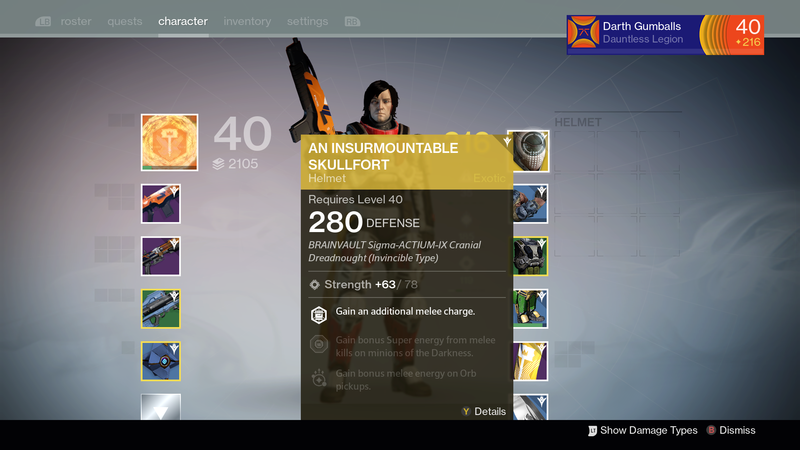 I was excited to see Xur return on Friday with new wares, and purchased my first Taken King Exotic, An Insurmountable Skullfort, to get a decent light level bump. My goal was to get as close to a 290 light level this weekend as possible, so with that in mind Friday I began running Strikes. The very first Taken King Strike I encountered was Cerberus Vae III, one of my least favorite Strikes in Destiny. Luckily they reworked the Strike a bit with new enemies, however the overall Strike plays out exactly as it did before. After this disappointing rehash I finally got into the new Strikes, and they were great! Every new Strike has an interesting aspect or two that makes them more fun to run through than the older ones. For example, the Sunless Cell boss fight in the dark is a blast! The first time I dove into the dark pit I felt my palms get sweaty as I had no idea what I was about to encounter, and my heart raced during the entire encounter until Alak-Hul finally fell. The Project S.A.B.E.R. Strike has its own wonderful moments, such as the beginning of the Strike in which your Fireteam has to avoid being overrun while defending an uplink. The Taken enemies really make this section of the Strike challenging and exciting. The last time I ran through it I could tell I was grouped with people who were running the Strike for the first time. Unfortunately, neither was utilizing voice chat (I have yet to encounter a single person in playlists who does) and I found myself the sole survivor of the initial onslaught which I somehow survived. The boss fight at the end of this Strike can be challenging the first few times, especially if your teammates don’t know what to expect, but once everyone knows what’s going on it’s actually rather easy. The Shield Brothers Strike can be one of the most frustrating, especially with no communication. Encountering the dual boss fight the first time is chaotic, however a lot of jumping seems to help the chances of survival. I’ve had a blast playing through all the new Strikes, even as I ran through them multiple times. The amount of engrams dropping all the time makes it hard to stop running Strike after Strike. I’ve watched my light level constantly creep higher, and ended the day at 254, just shy of the 260 recommended for the Heroic Strikes. I tried entering a Heroic Strike at a lower light level (the Shield Brothers) but it proved too much to handle and I had to bail out as we never would’ve completed it. I’ve also had fun in the new Crucible modes, although I’ve always been a terrible PvP player. I’ve played more matches than I normally would have throughout the week because after every other match I was getting Strange Coins while on a losing team. I looted at least ten Strange Coins through just a few matches which left me with more than I had ever had at one time by the end of the week. If they continue to drop as frequently in the Crucible I’ll probably play more than I ever have to prepare for Xur’s weekly visits. This entry was posted in Video Games and tagged Crucible, Destiny, Project S.A.B.E.R., strange coins, strikes, Sunless Cell, The Taken King, The Taken King Strikes, Xur. Bookmark the permalink. Destiny: The Taken King is a blast so far!